Playing with some new lights in our studio, photo by me. 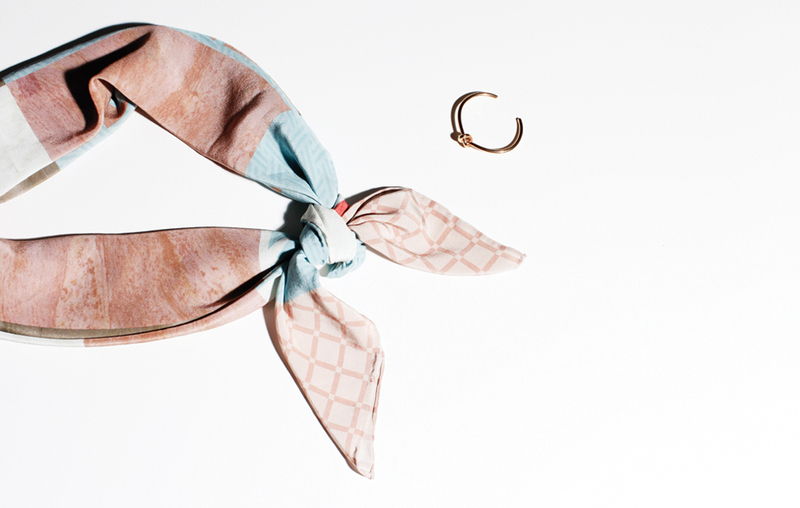 Ostara scarf by Rapp (thank you Eloise & Ana) and rose gold knot bracelet by Céline. A silk scarf has become one of my favorite things to wear, ever since I got this printed scarf from Céline. I ended up wearing it constantly this winter, so I was delighted when Rapp sent me this beautiful silk scarf to keep. With a spritz of perfume and tied in a knot, I like wearing my scarves in a basic bias fold and wrapped twice with the knot at the back of the neck. Paired with a simple solid cashmere sweater, sleeves rolled up and a bracelet pushed up high on the arm.